In early times monks and nuns would walk from town to town and when invited, sit down and teach. Reviving the simplicity of this tradition, Khenmo is creating pop-up meditation in various communities around Portland. 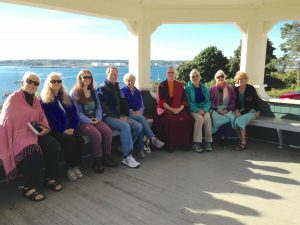 In each session Khenmo will give a short teaching and guide sitting meditation and/or walking meditation in the fresh air and beauty of Maine. Khenmo Drolma, Abbess of Vajra Dakini Nunnery, will offer a “pop up meditation” in conjunction with the Museum Poppy Project. Looking back 100 years to World War 1 can be an occasion to reflect on our precious and short human life. Like the peace declared by the 1918 Armistice, meditation is a key to peace in our lives. After a talk on impermanence as a source of mental peace, she will lead walking meditation through the Poppy exhibition. Celebrating Buddha’s first teaching, this retreat includes a talk on the Dharma by Khenmo and sitting and walking meditation. 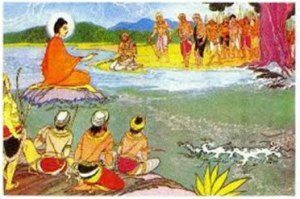 Khenmo will teach what is believed to be Buddha’s pith instructions using the perspective Theravadin, Zen and Mahamudra philosophies of taking them to heart. Space is limited; contact Ginny to register 207 846 8863. 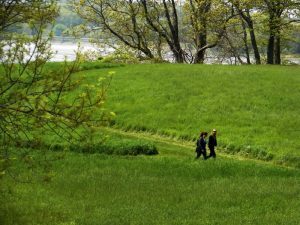 Wednesday Walking Meditation at Audubon Gilsland Farm July 18 – Sept 5, 6PM With a brief introduction, walking meditation can pacify the day’s agitation and stress! Khenmo will give instructions and an illuminating theme for the evening to contemplate. Meet in the back parking lot. Join Khenmo for a series of Pop up Meditations designed for summer. Gathering outdoors in three of Portland’s loveliest parks we will focus on three of the traditional postures for meditation; standing, walking, sitting and lying down. Designed for all levels of experience, Khenmo will give a short teaching on meditation specific to the posture and mindfulness of body, feelings, mind and phenomena. You will get an overview of meditation basics refreshing reminding or introducing calm abiding with your mind In a relaxed and intimate setting. Loring Memorial Park (Northern tip of the Eastern Prom Trail near Jack Elementary School overlooking Back Bay) Meet at the circle. Gilsland Farm (Audubon in Famouth) Meet in the far parking lot near the Visitors Center. Fort Sumner Park (On North Street in the Munjoy Hill neighborhood) Meet at the overlook benches. Fort Allen Park (Southern tip of the Eastern Prom overlooking Peaks Island) Meet at the Gazebo. Schedule a Pop-Up Meditation in your neighborhood.